Simple snacks for lazy summer days. Time to make some Basil Tuna Tomato Bruschetta! It’s so weird because it gets hot outside and all we want to do is use our grill. Our grill is essential for us, especially during the summer. 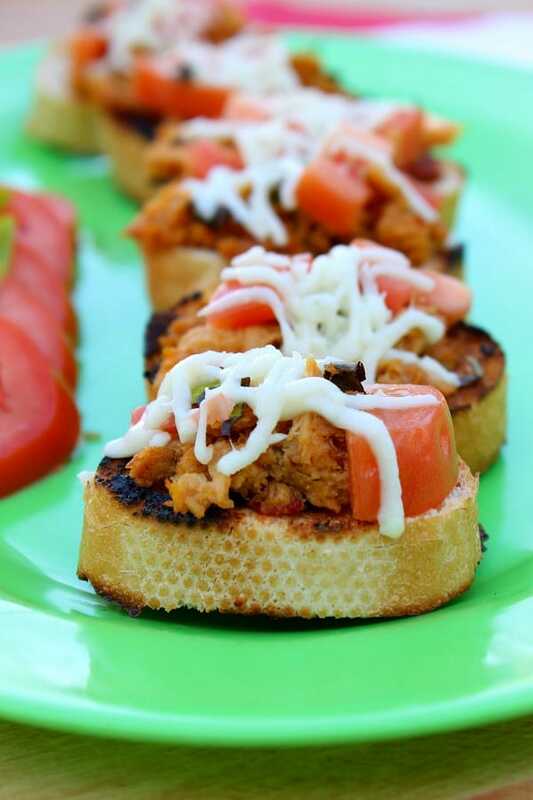 We make all kinds of things on it from pizza that we adapt for the grill, to veggies or these bruschetta. Last week my hubby was traveling and I wanted to make something quick simple and easy for the kids and I. We have fresh basil and tomatoes growing wildly right now so I knew I wanted to use that. I then decided to top it with tuna. Tuna is a staple in our house. We kind of use it on everything from salad, to pizza and to these patties! 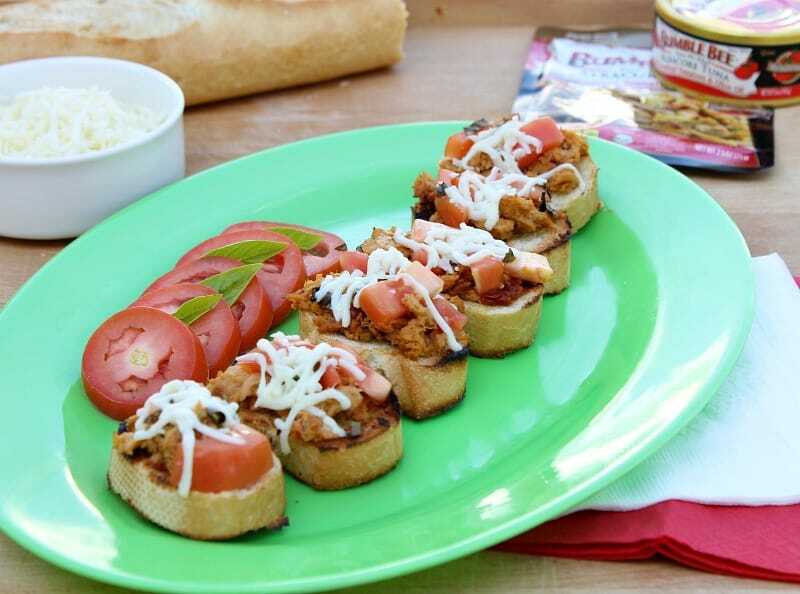 When making these bruschetta (by the way it is pronounced bru-shetta not bru-sketta, so to be clear) all you have to do is use some fresh ingredients and a really good can of tuna, some cheese and you are all set! I used Bumble Bee Sensations® Seasoned Tuna Medley Bowl Sundried Tomato & Basil. Bumble Bee® Prime Fillet® Gourmet Flavors Albacore Tuna combines the highest quality albacore tuna with the finest, restaurant-inspired ingredients. Convenient and nutritious. Available in 2.5oz pouches or 5oz cans. 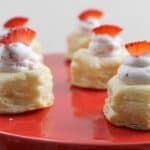 I used the 2.5 oz pouch for this particular recipe but if you want to double the recipe and make the bruschetta for a lot of people then you can just use the can! Tell me, which are your favorite Bumble Bee® recipes? I would love to hear and get some suggestions on what I should make next! 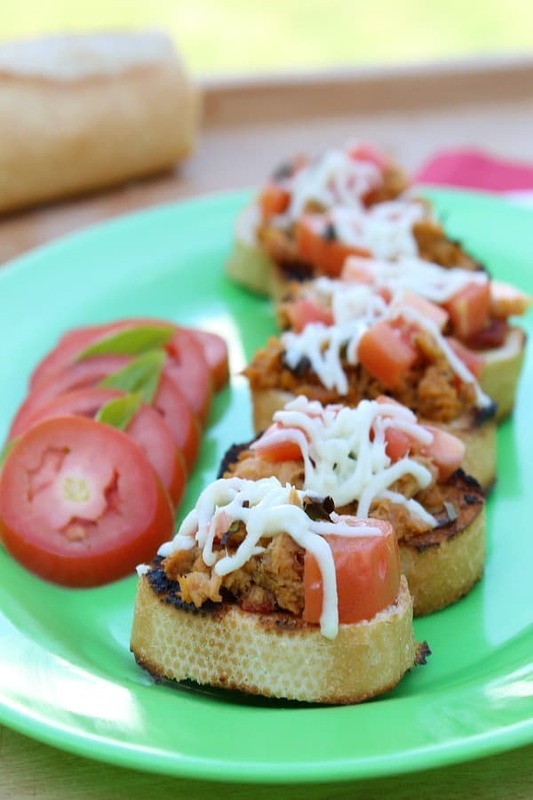 Basil Tuna Tomato Bruschetta made with sun dried tomato tuna. 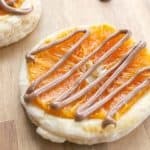 Perfect for easy snacks! Preheat grill to 300 degrees or medium heat. Slice baguette into 6 pieces. Brush one side of bread with olive oil. Lay that side down on grill. Cook for 2-4 minutes until golden brown (or darker if you like a crunchy bruschetta). Brush the top side with olive oil and flip. Top bread with tuna, tomato, cheese and basil. Repeat on each piece of bread. Allow to cook for 2-4 minutes until golden brown (or darker if you like a crunchy bruschetta) and the cheese has melted. Please note grill is hot, so be careful when topping the bread with ingredients! I have never seen the seasoned tuna medley – I will have to look for it the next time I’m at the store! 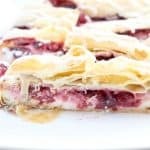 This would make a nice simple dinner with some fresh fruit – it’s been too hot here in Phoenix to cook much of anything! 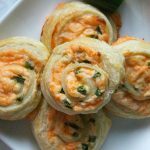 The perfect summer lunch or appetizer! I have a whole bunch of Tuna right now and I was trying to think of how to use it. this is great! 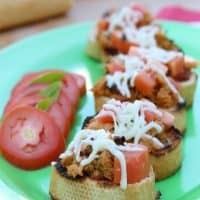 I rarely get creative with tuna and that needs to change — this bruschetta is such a great idea and looks delicious!